Shall We Make Our Own Adult Coloring Books? I have seen a lot of articles lately about "adult coloring books." These have been around for years under other names, but only finally have adults caught in that coloring can be so good for your mood, your creativity, your attention, and your brain. I have a friend who adores the work of Lisa Congdon, whose books you can find here. For more information, check out this article, "Three Reasons Why All the Adults You Know Have Started Coloring Again," on Upworthy. And try to get your hands on Lynda Barry's wonderful new book called Syllabus. She writes about the importance of having her students color--a lot!--before they begin drawing and working with their own images. I know from my own scribblings that drawing first with black pen and then "coloring" with water colors is a great delight. Thinking about the new adult coloring book craze has me planning to do drawings on smooth paper, and then color with pencils or even crayons. Probably I will scan the black and white originals then print out and color the copies. Why not make our own coloring books? Has anyone done this? This month and next, I'm lucky enough to be receiving training in digital storytelling--a new way for a storyteller and visual artist like me to create! I am quite excited. To prepare myself, I've done a little learning with iMovie (I know, I know, everyone under thirty can use iMovie by instinct, but I'm older than that and had to learn). And I've made a few super short films to practice. Not long ago I participated in a virtual sketchcrawl with Urban Sketchers Midwest, and I took along my trust iPhone to capture some photographic images--as well as some sketched images--which I might use in a short film about the outing. As I mentioned, the possibilities opened up by my learning how to work in short short films thrill me! I found during the morning that in addition to paying attention and really seeing the surroundings and the people there because I searched for something to draw, I looked and saw in a different way as I considered what could provide good elements and variety in a video presentation. The two different art forms fed each other that morning. I look forward to making more videos of anything, especially of people creating! Guess I'd better find out more about working with YouTube and Vimeo. If ever I wanted to point to evidence that the last eighteen months of concentrated sketchbook scribbling has changed my life, I would point to last week's summertime chore: power washing the porch and sidewalks around my house. There I stood, mindlessly shifting the power washing wand back and forth in even stripes to wash away the built up grime that comes with living in the woods when it hit me! I didn't have to simply erase the grunge on my sidewalks. I could draw in it! This resembled an exercise I did once somewhere that starts by filling a blank piece of paper with an even layer of pencil or charcoal, then using your eraser to draw. So first, just to see if I could control the 1700 psi power washer, I tried to draw a big owl. And it worked!!! I liked it enough to snag this photograph, but then, I washed it away and moved on to the next section of sidewalk. There I tried to work out more of a scene, but making the subjects smaller made it much harder to control the power washer wand! I confess I've left this one on my sidewalk so that I can show it to a friend or two before I finish washing it away. Would you ever have thought about using a power washer to make art? I know it never would have occurred to me if I hadn't spend the last year and a half drawing all the time, in many situations, using tons of tools to make marks on different surfaces. So this time I used a power washer as a "pen" and a concrete sidewalk as my "paper!" Best of all, a kind of boring yard work task became an opportunity to make art, to renew a spirit of fun and share it with others, and to decorate my house (even if only for a few moments). 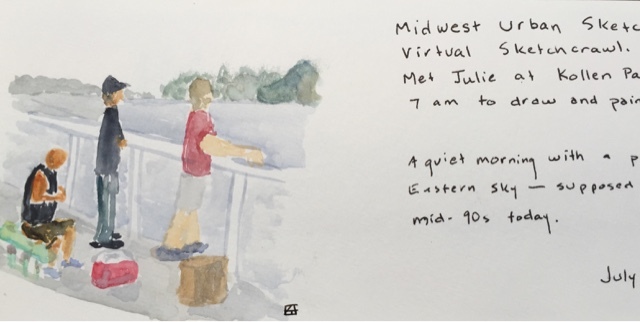 Went on my first virtual SKETCHCRAWL this morning, thanks to Urban Sketchers Midwest. Visited Kollen Park in Holland, Michigan with a friend to draw. 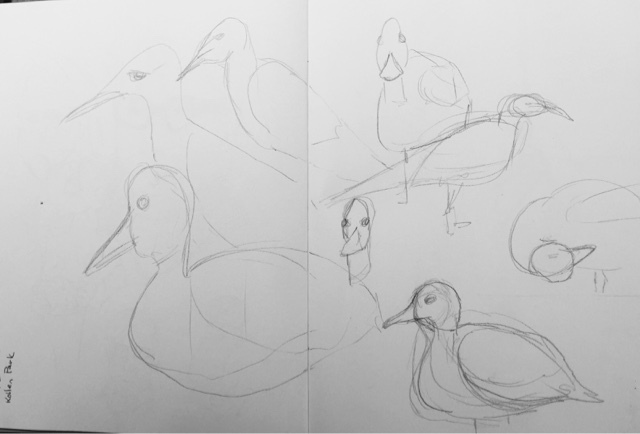 First, I warmed up in pencil on ducks and gulls. 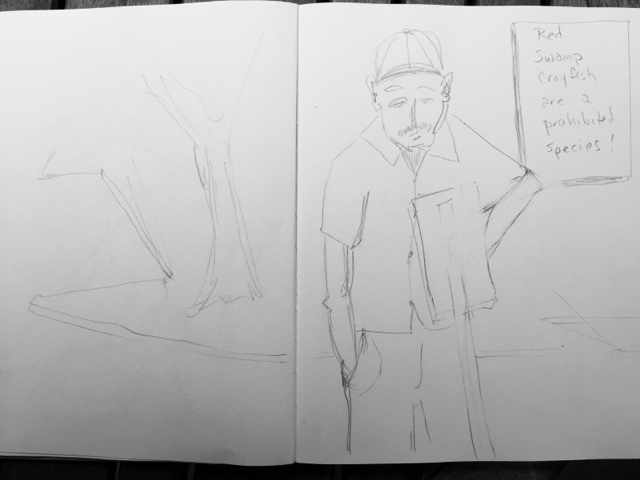 Then I warmed up on a man studying a sign which told him he could not use Red Swamp Crayfish for bait. 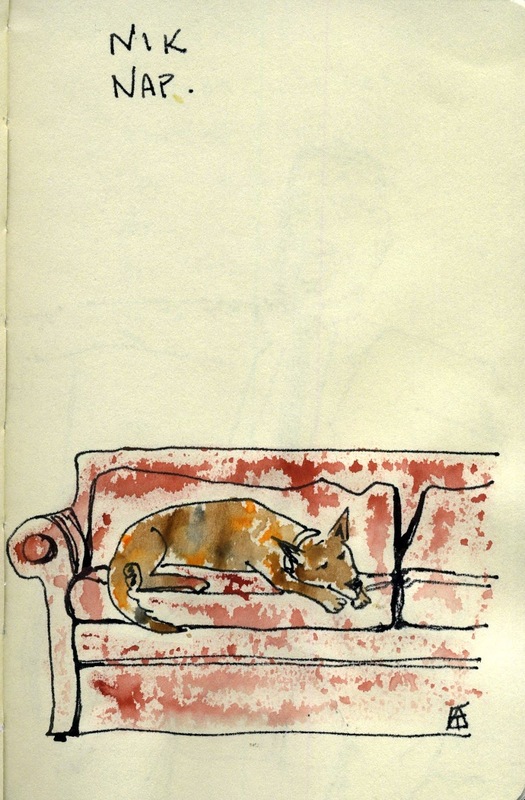 Then I switched to pen and watercolor. 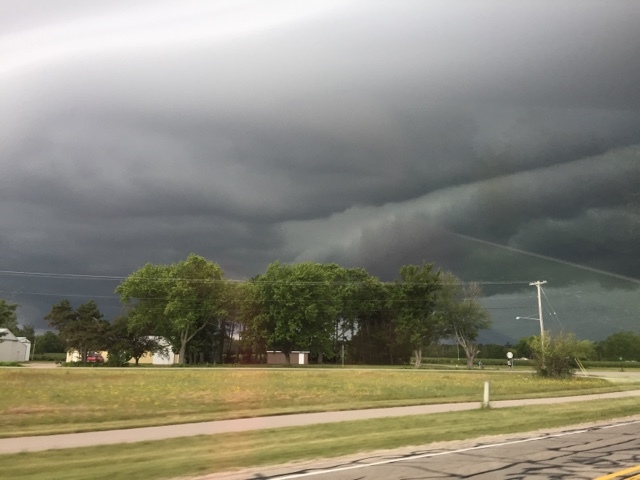 I got all this done in about 90 minutes and then a big storm rolled in, so we skedaddled! It was great fun to get out and about to sketch with friends. Can't wait to do it again! 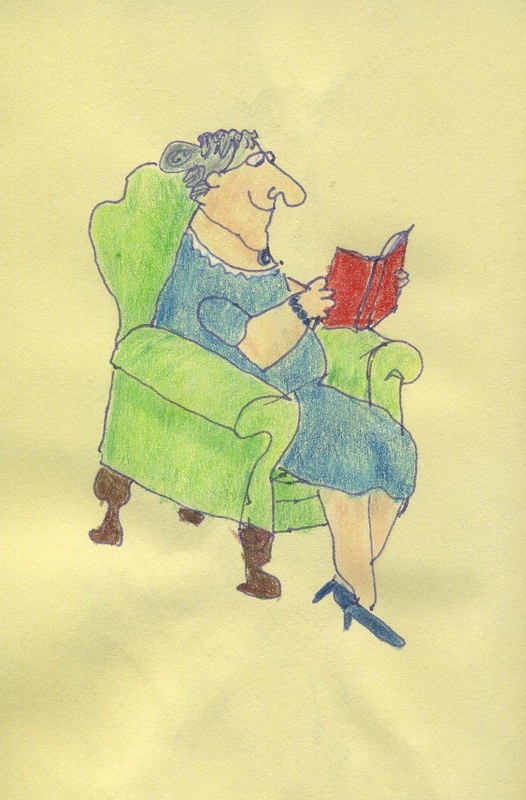 After copying many drawings by William Steig, I decided to try some original drawings in his style. None of these were careful or painstaking drawings. These were all my usual quick scribblings. I just hoped to see things a bit differently and render them a bit differently using someone else's style. 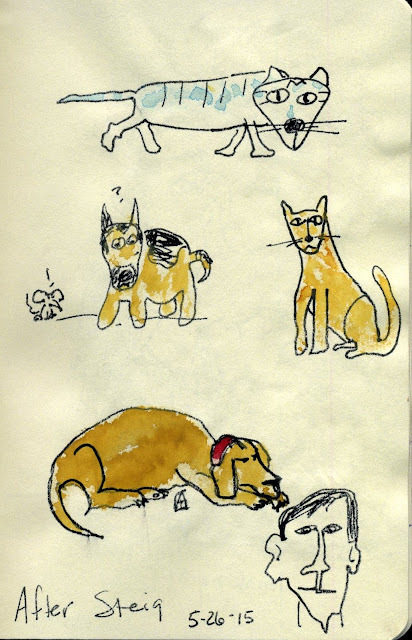 First, a few drawings of animals which basically copy Steig's work, but which I recolored to fit my own dogs. 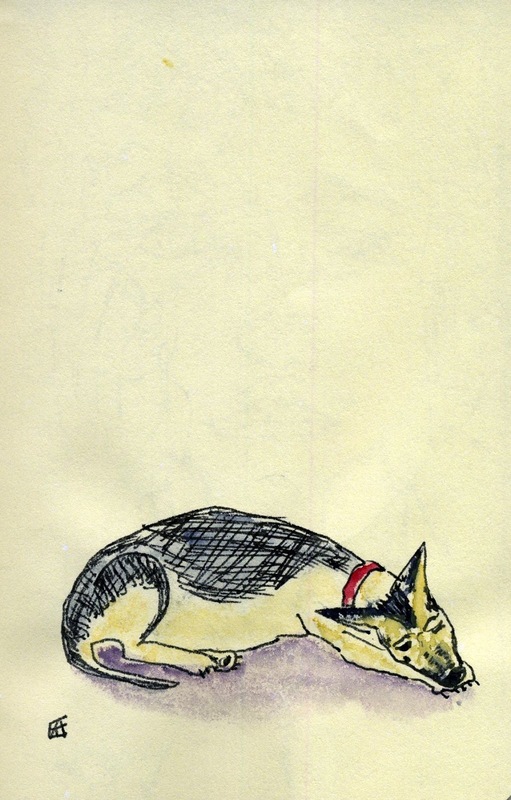 I have shepherds and all of Steig's dogs (at least, almost all of them that I could find in my book) have floppy ears. In this next one, you'll see that I just took the yellow dog from Steig (above) and redid it into a chubby German Shepherd. My dogs aren't chubby, by the way! As an unrelated note, I really like the empty space in this one. I tend to fill my pages. But I am learning from looking at other people's work that empty space can really make a page look nicer! I'm going to think about that more in the future. Next, I returned to an older sketch I had done of my cat, Hattie, which I didn't like very much. I added a Steig-style drawing of her right into the original sketch. So, you'll see below, the cat on the table in the upper right is the added bit. 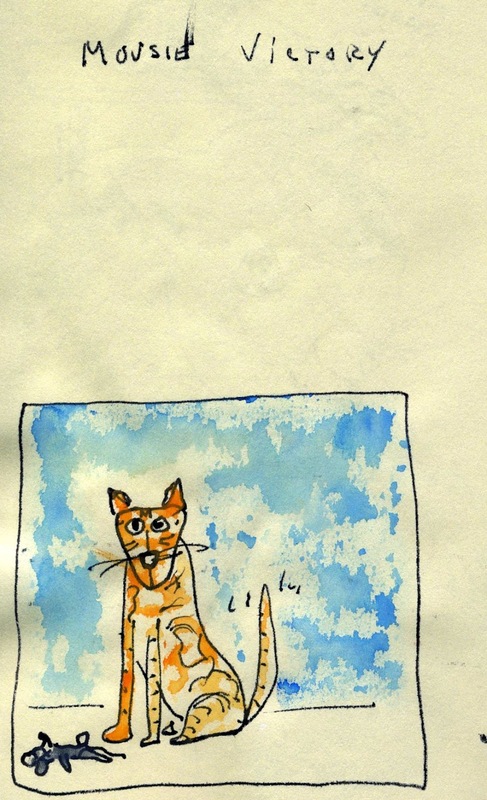 I decided I should do one of my other cat, Tim. He had killed a mouse the night before and was very proud, so I decided to try to capture that moment. I also played a bit more with the page design I had like earlier. Though I had drawn the cats from memories of their recent activities, I turned next to my dogs who were sound asleep. Stationary! I drew them from observation, but in this comic style. I did all of these on the interesting sugar cane paper I've work on for a while. I really enjoy the unpredictable watercolor effects I get when working on it. I am very pleased with what my work with this mentor artist has given me in terms of ways to render my own subjects in my own style! I think this will really help me improve at capturing things quickly, when I am out and about, or dealing with subjects that move. Looking at his drawings has given me new lenses through which to look at my own world, particularly regarding simplified lines and shapes. Simple--but not easy! 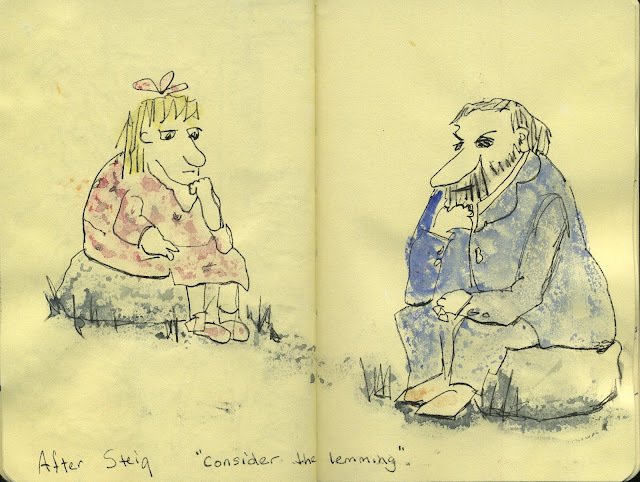 My plan now is to put the Steig book away and not look at it for a few weeks, just to let it sink in and to continue to play with and incorporate what I've observed into my own practice. Then, in a month or so, I'll pull it out, copy some more, and see what else I can learn. I've created a few posts about my use of William Steig's drawings for inspiration lately. I wanted to share my latest scribble, drawn from imagination of my four animals, in my own style, but clearly influenced by the mentoring of Steig. Nothing fancy. And certainly not realistic. But for me (and anyone who knows these animals) it captures them simply and essentially. It is delightful to feel like I can capture them in comics as well as observationally (more realistically). 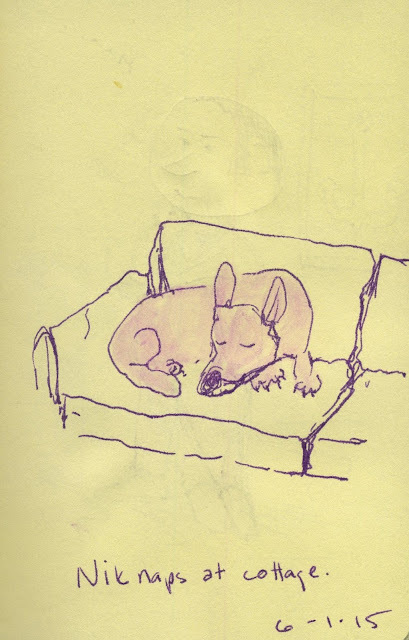 I found a book of drawings by William Steig on clearance the other day and fell in love with the quirky drawing style. This, I thought, is a style I want to emulate! I'm going to buy it, take it home, and copy some of these, so I can learn to incorporate some of his style into my own work. Only after I got home did I discover that Steig had written the children's book Shrek! And more important, he wrote one of my most favorite childhood books, CDB! I actually still have my copy of that book from the late 1960s. 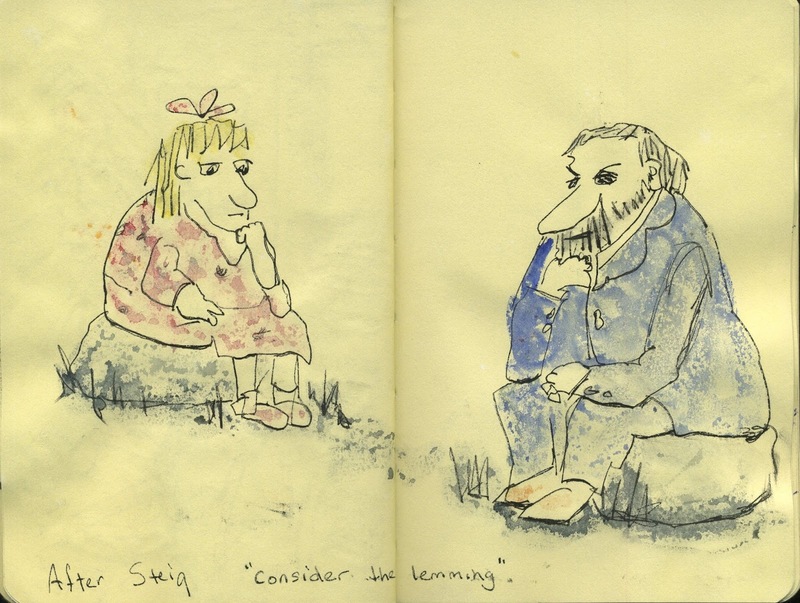 So here are a few examples of what I call interpreted copies I did of Steig's work. That means I mostly copied what he did, but felt free to change it up if I wanted to. I used sugar cane paper because of it's interesting resistance to watercolor. I did probably a dozen more. Copying these helped me begin to understand new ways to do turned heads (not just straight on or in profile, which is what I tend to default to), how to do hands that work without being fancy or super accurate, how to do feet a angles, and some approaches to animals. 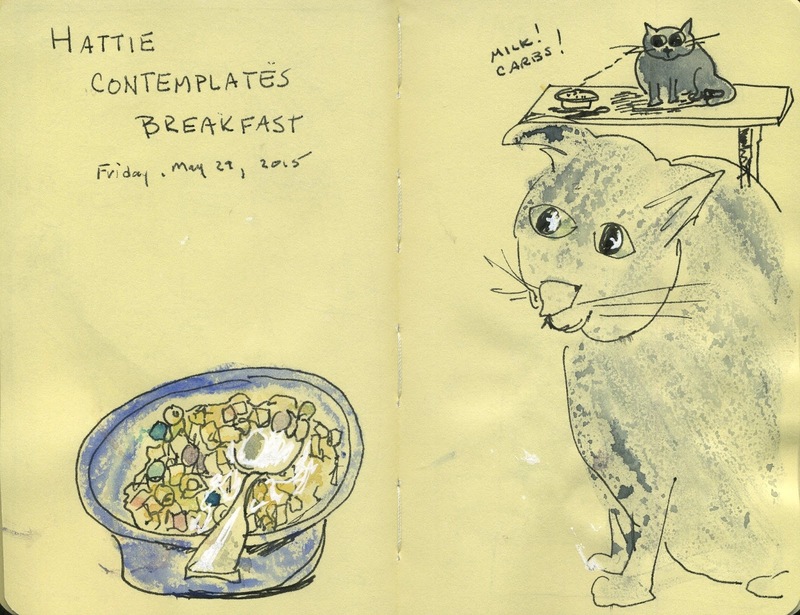 As much as I love scribbling from observation--urban sketching--I also love interpreting things as comics. I feel like studying Steig has helped me grow new skills. The tradition of copying masters is a long one in visual arts. Even these quick scribbles--because that's what they were, quick and lively interpreted copies, not painstaking exact copies--helped me learn something new. I encourage you to head to a bookstore or library, or even look online, find an artist whose works contain something you wish you had in your own style, and create some interpretive copies! Next up: I want to try to apply this style to some drawings of my own and see what happens. Friends of mine and I played a scribbling game the other day (yes, I am lucky to have that kind of friend!). We all sat down and drew blind contours of each other's heads, then turned them into comic-style characters with imagined bodies and backgrounds. Have I mentioned we live near an area with a lot of folks of Dutch descent? 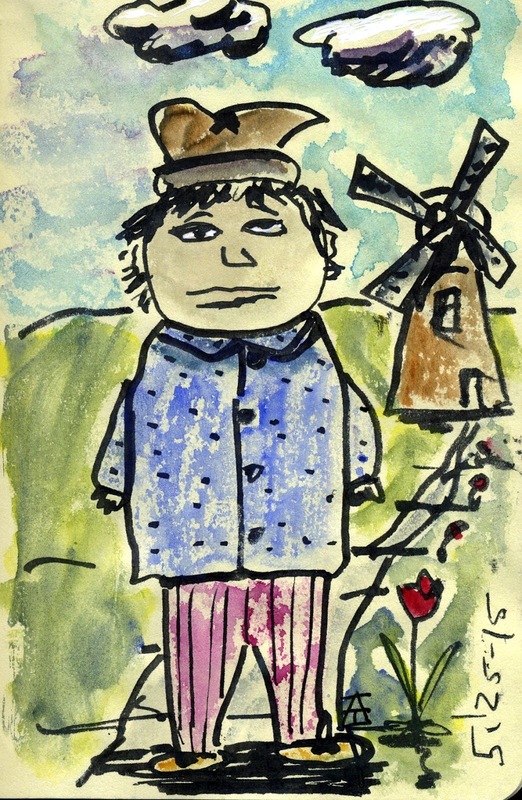 The person who modeled for the blind contour is not Dutch! Imagination played a big part in this game. 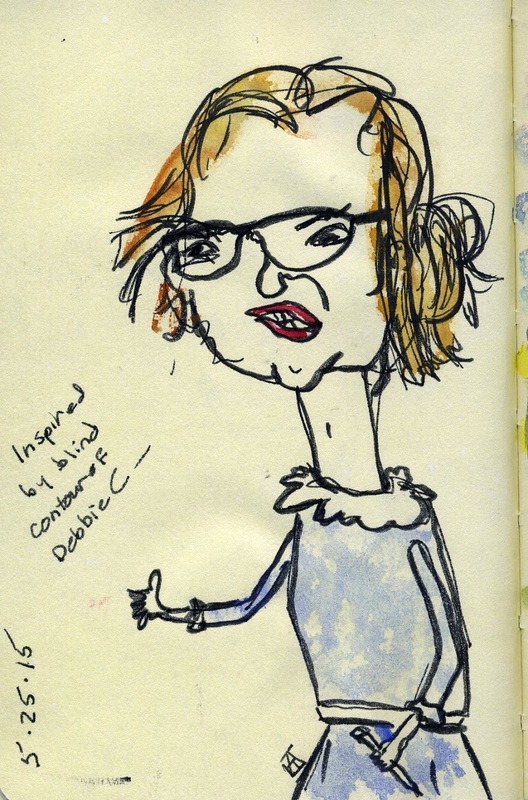 The friend who modeled for this crazy scribbled lady is one of the sweetest people I know! It was a riot to take the wonkiness of the blind contour portrait and turn it into a character so completely different. Drawing games--super fun. Enjoy some of the classics like Exquisite Corpse, but don't be afraid to make up your own. My family enjoys a cottage in northern Michigan, USA. In late May, the neighborhood buzzes with activity as people clean up after a long winter and get ready to enjoy the beautiful--though very short!--summer. 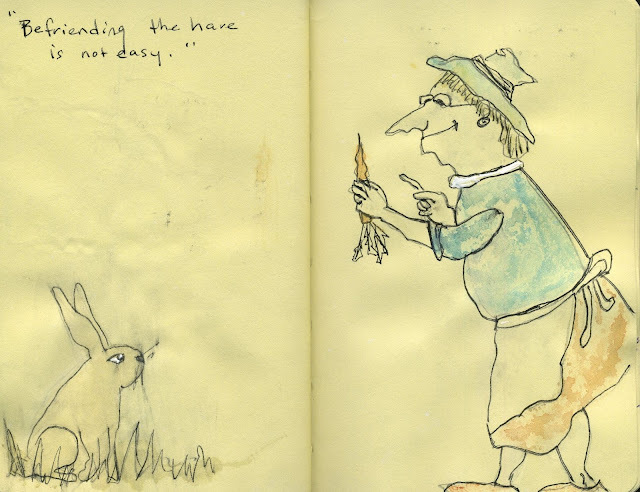 Here are two quick sketches captured on sugar cane paper of the spring time goings-on. 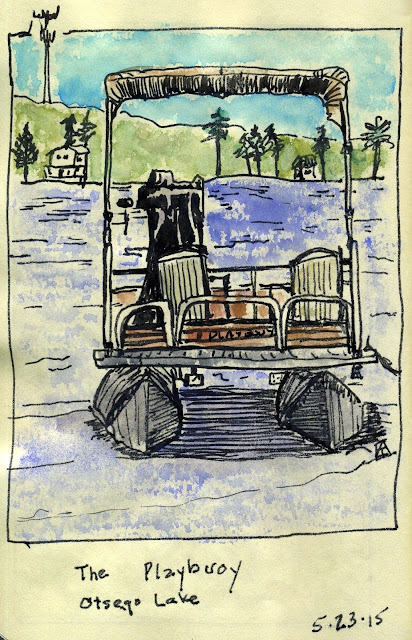 In the sketch of the boat above, you can see the wonky way this paper takes water color--it paid off in interesting texture for the water, I thought. I like the uncontrollability of it. Here are my neighbors raking leaves. LOTS of leaves! This time I really saturated the paper and the watercolor soaked in a bit. Then, for fun, I tried another sketch of a recently installed dock and boat on traditional watercolor paper. Big difference! 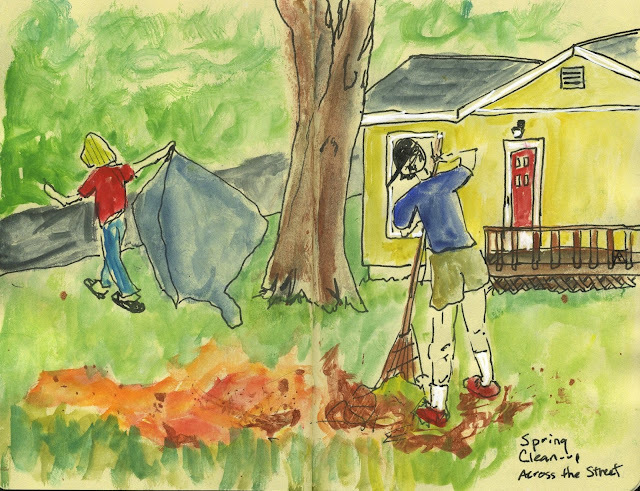 Capturing some of the normal "goings-on" in the neighborhood in your scribbles is a fun way of paying attention to the every day things that make up all of our lives. Catching seasonal special events like these helps me get a stronger sense of the cycle of life. It's kind of cool.